A few days ago, I had placed an order for tea from Namring Tea Estate. It was the first time I had placed an order for a first flush. Last week I received the package from TeaBox.com. 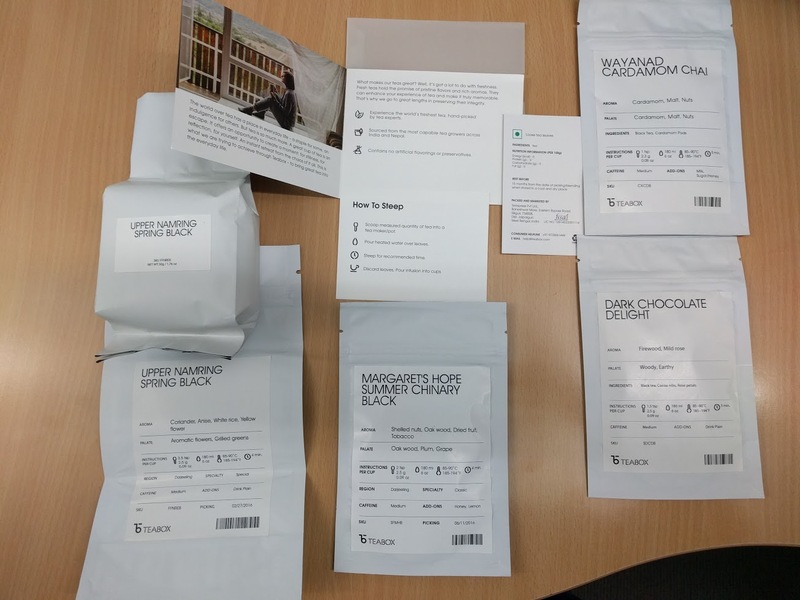 Along with the ordered tea, they had also packed three samples – Margaret’s Hope second flush, some blend they called Dark Chocolate Delight and a packet of Wayanad Cardamom Chai. The good guys at TeaBox had also packed an empty ziploc bag for the Namring tea, so that I could transfer the contents of the sealed packet for repeated use. Along with all the tea, there were two brochures that had some brewing information for a first time tea drinker. I will be honest. Even though I have paid good money for the Upper Namring first flush, I loved the Margaret’s Hope second flush more. Maybe, the former was lighter than what I am used to. Maybe, it would take some more cups before I start enjoying it. Initially, I did not like the Dark Chocolate Delight. In fact, I openly cursed it at my office. However, it grew on me as the stock neared its end (Their sample sized packets are supposed to make 4 cups. I could comfortably make 5.) I finished it today and to tell the truth, I could have a few more cups of its rose flavoured goodness. I gave the Wayanard sample to Rueben. His wife drinks milk tea and could enjoy it better than a lactose intolerant guy like me. She said that she liked it. I guess it would be appreciated by people who love the intense flavour of CTC tea boiled in milk.